Open All Year... The Hotel Grande Bretagne offers the best location in Athens, within short walking distance from the business center as well as the fashionable Kolonaki Square with exclusive shopping, entertainment, restaurants and cafes. The Grande Bretagne represents the essence of hospitality in Greece for more than 130 years. Since it reopening in 2003, the promises of defined excellence have even been exceeded. The Hotel was proud to be again host to the world of sports on the occasion of the Olympic Games that took place in the country of origin in 2004. For all guests the Hotel Grande Bretagne offers a special treat with the impressive SPA area, designed to relax and refresh body and spirit. Discerning Travelers from all over the world are invited to revitalize their energy in elegant Recreation Areas, dive into the freshness of the indoor and outdoor pool or indulge in a wide range of beauty and wellness treatments. The Hotel Grande Bretagne offers the best location in Athens with spectacular views to Acropolis and sets a spectacular example in the international hotel business, offering pure luxury in service and living. This prestigious hotel, reflecting Europe's finest history and hospitality, is a perfect asset to the legendary hotels of The Luxury Collection brand within Starwood Hotels & Resorts. The Grande Bretagne has reached a new era of defined excellence. Your stay with them shall be crowned by every conceivable amenity and impeccable service. The Grande Bretagne is not simply a luxury hotel in Athens (surely the most luxurious establishment in Greece) - it is an institution in itself. Ever since it opened its doors to receive the first visitor in 1874, the Grande Bretagne has been a point of reference in the social, political and economic life of Athens and, by extension, of the whole of Greece. Over the 126 years of the hotel' s existence one also observes the evolution of a basically agricultural society -just half a century after the country's liberation from the Ottoman rule and the creation of a tiny, impoverished country- through the gradual stages of development leading to a modern State and the creation of an important middle class with a European character. Over this period, the country lived through an unfortunate war with Turkey, two Balkan Wars that tripled its territory, two World War~, the Asia Minor Disaster and its accompanying radical transformation of the structure of Greek society, and the Civil War, with its catastrophic consequences. At the same time, the nature of visitors traveling to Greece changed radically, passing from a few thousand wealthy travelers -admirers of Ancient Greece and its monuments- to millions of visitors, whose interests also encompass seaside resorts, entertainment, business or governmental leasing. All of these developments had serious repercussions on the Grande Bretagne's evolution, whose very creation -thanks to Efstathios Lampas' perspicacity- though undoubtedly excessive when compared to the needs of the time, was instrumental in both introducing Western standards and creating a strong bourgeois mentality in what as yet was the young Athenian society. The existence of a hotel on an equal footing with similar European establishments, where visitors felt at ease in a familiar environment, contributed to the development of a flow of high-level travelers and became the prototype for the later development of other hotels and related activities. Crowned kings and princes, Heads of State, Prime Ministers and Ministers, business tycoons, prominent names in Literature and the Arts, renowned journalists, well-known theatre actors and film stars and many other travelers were regular patrons of the hotel~ which became the Greek State's official guesthouse. Athenian society embraced the hotel. The Grande Bretagne, in the way of the great luxurious hotels in the rest of Europe, was always the venue of the Greek capital's important social gatherings. Receptions, balls, cotillions, marriages, fashion shows and banquets were regularly held in the hotel's halls, while the lounges, salons and the bar were the meeting place of businessmen, politicians and journalists at the same time as being a favorite haunt of cosmopolitan Athenians. As the history of the Grande Bretagne unfolds, so does the transformation of the city of Athens, as well as the political history of Greece, with which the hotel is indissolubly associated. There is no political or historical event in modern Greek history with which the Grande Bretagne is not somehow linked, by one means or another. It should be noted that, with the exception of the 36 new rooms added on the sixth and seventh floors in 1974 and the creation of the GB Corner and new bar in 1976, no major modernization had been carried out on the Grande Bretagne’s premises since the mid-1950’s, when the wing overlooking Constitution Square was rebuilt. As a result, the hotel's furniture, and its interior decorating in general, were beginning to show signs of "time fatigue", while all of its installations (heating, air conditioning, bathroom facilities, lifts, telephone and appliances, had become antiquated, constantly breaking down and needing maintenance. In this respect, the year 2000 marked an important milestone in the Grande Bretagne’s recent history as it heralded the entry of Hyatt Regency SA in the capital of Hellenic Hotels Lampsas SA. Through the Athens Stock Exchange, Hyatt Regency acquired a majority stake in the company, allowing it to control the Board of Directors and implement a radical renovation of the hotel's premises. 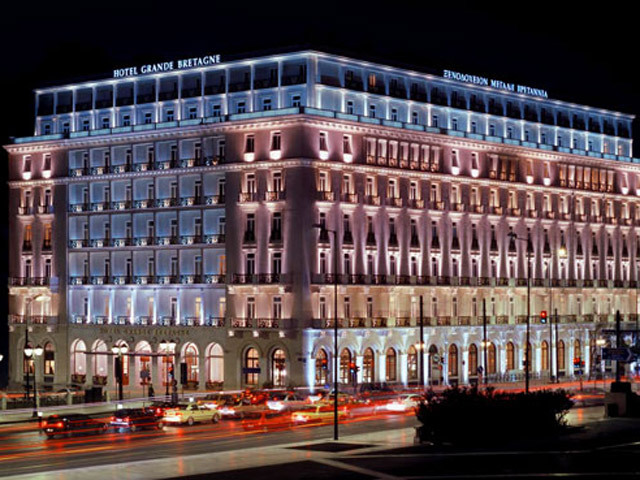 In 2005 Hyatt, following a restructuring of its strategic planning, sold its shares in the owing company of the Hotel Grande Bretagne to the Laskaridis shipping family, who were already major shareholders in Hellenic Hotels Lampsa SA. Following this transaction, the Laskaridis family controls in excess of 60% of the equity. The Grande Bretagne has been restored to its former glory and transformed into an establishment capable of meeting the modern requirements of hotel hospitality, while simultaneously contributing to the upgrading of Athens' hotel infrastructure. Finally, it is not by accident that Starwood Hotels & Resorts Worldwide Inc., the large international corporation in charge of the hotel's management for the next twenty-five years, has listed the Grande Bretagne in its “Luxury Collection", which includes some of the most luxurious hotels across the globe. Approximately 82 million euros were invested to create a state-of-the-art, five-star hotel worthy of that title. Reconstructed from top to bottom, it features 290 rooms and 31 suites, all of them newly refurbished, and redecorated in keeping with the old Grande Bretagne’s traditional style. These are completed by modern networks and facilities, the hotel's premises also housing three restaurants, two swimming pools, a spa, spacious halls and conference rooms as well as all other comforts expected of a European deluxe hotel of the twenty-first century. The Hotel Grande Bretagne offers the best location in Athens, within short walking distance from the business center as well as the fashionable Kolonaki Square with exclusive shopping, entertainment, restaurants and cafes. Also nearby are important museums and the historic and picturesque old quarter of Plaka with tavernas, open air coffee shops, flea market and souvenir shops. A large number of rooms offer splendid views of the Acropolis, Parliament and National Gardens. The Hotel Grande Bretagne is an architectural landmark and the historic grande dame of the city. The Hotel is located 27 kilometers (approximately 45 minutes) from Eleftherios Venizelos, the new Athens International Airport. Transfer taxi or limousine to and from the airport available, on request. The most famous brasserie in the capital lies to your right as you walk into the lobby. The GB Corner is famous not only for its unique ambience and excellent Mediterranean cuisine, but also for its clientele. Highly renowned Athenians meet there to partake in GB Corner's refined environment, complete with its luxurious yet functional lighting and the unique comfort afforded by perfectly designed chairs and dinner tables arranged to allow privacy in crowd. GB Corner sets the standards against which people measure the best of Athens eateries. Located in a corner of the hotel’s main lobby, GB Corner is the property’s signature restaurant. It boasts a sophisticated, yet lively, atmosphere. Much of the mood stems from its 1900 art-deco interior design, which is essentially elegant in style and a delightful reminder of such a charming era. The varied, colorful, Mediterranean menu by Chef Bertrand Valegeas is complemented by the relaxed and comfortable surroundings. An open kitchen enhances the atmosphere of the restaurant. Drop in anytime for lunch or dinner from 12 noon until 2 o'clock in the morning and dine in the company of the capital's most influential writers, politicians and professionals. Relax at one of the exclusive ground floor tables or luxuriate in the historical loft with its leather button sofas. Whichever you choose, you are sure to be impressed by the speed of the service. And as you savor the tantalizing cuisine, let your eyes wander over the rich collection of art deco from the 1900s. Relax and allow yourself to be carried away by the magical sounds of instrumental melodies. GB Corner is the ultimate Mediterranean experience in a truly historic city. This is the place to be seen in Athens. Unparalleled in the capital, this magnificent roof-top restaurant with contemporary design provides breathtaking city views. Stunning vistas summon up a totally relaxing ambience for breakfast and dinner year round. The restaurant re-opened in June 2006, following a complete renovation. Grilled steaks, fresh seafood and the very noblest of Mediterranean cuisine from Chef Emilio Bracciale are served, as guests savor the experience of watching the sun set majestically behind the ancient Acropolis, firing the imagination to thoughts of a truly classical age. Open now during breakfast, lunch and dinner, you are given the opportunity to enjoy your meal with great view of the whole of Athens. Regardless of the weather, sunny, cloudy, rainy, windy, have a unique experience in the GB Roof Garden. Luxurious fabrics and restored antiques personalize the 321 rooms and suites, all newly renovated. Distinctly refined residential elegance is reflected in each of the 59 well appointed suites, while butlers and staff provide unsurpassed service. All rooms and suites offer the finest appointments : beds are cocoon of pure comfort with multiple pillows and cloud soft duvets, plush bathrobes and slippers the wall-to-wall marble bathrooms are well designed with fog resistant mirrors, quality amenities and lighted magnifying mirrors. All rooms are equipped with cable television, voice mail, high-speed internet, mini bar and wood-paneled wardrobes with in-room safes Precious fabrics, fine furnishings, and the latest high tech facilities, carefully combined to preserve a perfect harmony. Deluxe Rooms The special features of the premium deluxe rooms are warm colors, classical furnishings and unique views of the Parliament and Lykabettos Hill. With an average of 33m2/355ft2 these rooms epitomise class and sophisticated style. The accommodation offers a choice of king or twin beds. Junior Suite Elegantly furnished in a classical style and accented with antique oil paintings, these rooms vary in size (an average of 44 m2/470 ft2) and layout, typical of the hotel’s historic character and unique heritage. The exceptional views of Constitution Square, the Acropolis, or the Lykabettos Hill provide the finishing touches. There is a choice of king or twin beds in this accommodation. Deluxe Suite These suites are graciously decorated in classical style, finished in cream tones and earth colors. They have an average size of 50m2/530 ft2, and are comprised of one bedroom and a sitting room. This suite is the ideal place to become your hideaway for a day, a week, a year. Space to live in and to experience the charm of a grand hotel blended with the exquisiteness of a private home. Grand Suite Indulge your taste for the finer things in a luxurious suite, distinguished by generous space (an average of 60 m2/ 860 ft2) and classical style, decorated in warm earth colors. The sleeping quarters in this type of suite are secluded from the living and working areas, ensuring privacy during informal meetings or while entertaining. The bathroom offers ultimate luxury with separate bathtub, steam shower, and bathroom TV. Most of these suites offer views of the Acropolis or Constitution Square. There is a choice of king or twin beds for this accommodation. Grand Deluxe Suite The two-bedroom corner suites offer magnificent views of the Acropolis as well as the Parliament with the changing of the guards, and the National Gardens. With a large corner living-room and luxurious amenities, covering a total of 90 m2/960 ft2 these suites combine the tradition of a noble past with the requirements of contemporary travelers. Presidential Suite The Presidential Suite is uniquely designed columns and arched ceilings add to the charm of this spacious, 200 m2/2100 ft2 Sq.f. luxury suite. A large corner living-room overlooks the Parliament, the Acropolis and Constitution Square. Panel mouldings and the oval-shaped ceiling details create a classical touch. A private entrance foyer leads to the living room and dining area. The Suite has a large dining room, seating 12 persons, an airy master bedroom, with two-sided fireplace and separate sitting area. Additional features include the master bathroom with separate deep soaking jet tub, TV, steam bath and shower, and walk- in closets. The Royal Suite The Royal Suite of the Grande Bretagne offers 400 m2/4300ft2 of elegance, furnished with antiques and original artwork to create an unparalleled atmosphere of comfort and beauty. Located on the 5th floor of the Hotel, the Royal Suite offers a panoramic view of the city including Constitution Square, the Acropolis, the Parliamentt with the changing of the guards at the Tomb of the Unknown Soldier, and Lykabettos Hill. Created to offer the ultimate in luxury hotel living, the Royal Suite includes a triple living room with fireplace, two formal sitting areas palatial dining room with seating for 16 and a media room with state-of-the-art electronics. Residents of the Royal Suite can enjoy a variety of 300 different labels from the private wine cellar. The master bedroom, an expansive corner-suite with several seating areas, features a fireplace, walk-in closets, dressing room, a luxuriously spacious master bathroom equipped with a TV, glass enclosed shower and a separate soaking jet tub, as well as a fully equipped gym with sauna and steam shower. The Royal Suite is connected with two Grand Deluxe Suites.